Soon after my lathe arrived, I wanted to cut a left-hand thread for a project. 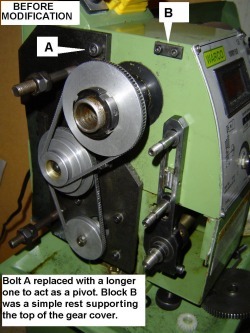 LH threads are no more difficult because than RH ones if, with the spindle running forward, the rotation of the leadscrew can be reversed. There was no provision for this on my lathe, but all it needed was an idler gear added into the geartrain between spindle and leadscrew. A tumbler reverse with a handy lever would have been nice, but there wasn’t room for such an arrangement, and reverse wouldn’t be needed very often. I went for a simple solution - when reverse was needed, swing the banjo forward to make room to fit a single idler between the spindle gear and the topmost gear on the banjo. The idler could have been carried on a stud and bolted to the headstock when required, but that would mean drilling and tapping the headstock. My lathe was still new, so I might need to erase all traces of any modification in case it had to be returned. Anyway, I didn’t trust myself to drill/tap in exactly the right place to get a good mesh between the new idler and the spindle gear, and I tend to mislay things like an loose idler and stud. So, I removed the uppermost Allen bolt (“A” in this photo) which attaches the large black plate to the headstock, replacing it with a longer bolt. A sleeve under the head of the new bolt serves as a spacer and clamps the black plate down. An arm, pivoted on the sleeve, carries the idler gear on a stud at its outer end. The idler can be swung in or out of position as required. The original block B merely acted as a support for the top edge of the gear cover. I replaced it with a larger block, to which the outer end of the arm can be bolted when reverse is in use. This photo shows the arm attached to the lathe, and in the “disengaged” position. The block has been replaced by one with a tapped hole, so I can bolt the arm to it when reverse is in use. The black plastic idler on the arm came from Little Machine Shop in California (usual disclaimer), a major source of spares for the “7x12 mini-lathes”. Like the Warco, they use metric Module 1 gears. I also ordered a bush and key (like those used with the Warco changewheels, but with a loose key) to carry the new gear on its stud. 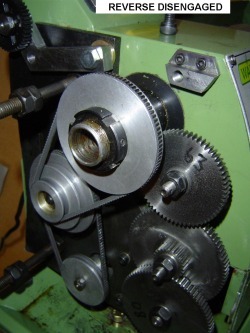 I chose a gear with 40 teeth, to duplicate my spindle gear, and designed the arm so the new gear would be positioned at more or less the same distance from the leadscrew as the spindle gear. This leaves the same space available between the new gear and the leadscrew, so all combinations of gears on the banjo would still fit between them. Here's the reverse gear in action. The banjo has been swung forward and the arm moved into place and bolted to the new block B. As can be seen at the bottom right, a change gear projects unsafely beyond the front of the headstock, so I have had to do considerable surgery on the gear cover to accommodate this and other modifications. Postscript: Things change. I didn’t anticipate using reverse gear very often. But I now need it for the dedicated fine feed banjo shown elsewhere, if the saddle is to move towards the headstock. I must devise something quicker and easier than a bolt to hold the outer end of the arm in place.